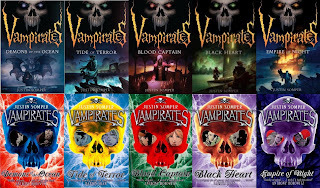 Any news to do with the Vampirates is big news for me, and today, the title for the sixth and possibly final book in the series was announced by Justin Somper himself! Immortal War! Argh! I love it. Nice and dark. Here's what Mr. Somper had to say about the title in his latest blog: " If you’ve read EMPIRE OF NIGHT, I think you’ll understand why the next book has the word WAR in its title." Excellent! Can't wait for it to be released next year! Published by: Oxford University Press. Official synopsis: "Hanna, Ned and their parents are on the holiday of a lifetime on the paradise island of Kaitan. But the idyll is shattered when pirates come in the night, burning their house and kidnapping their mother and father. The children are stranded, and don't even know if their parents are alive or dead . . . In this action-packed adventure, there is no one to help. Survival and escape are up to Hanna and Ned." 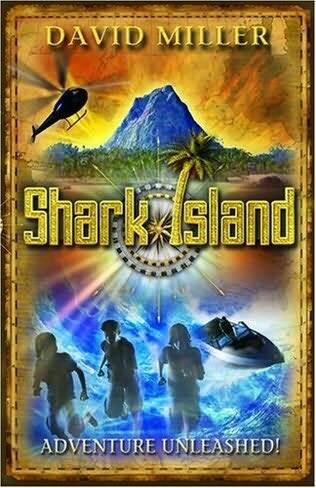 Shark Island is a remarkable, roller-coaster of a book. It is gripping. Once you get into it, you literally cannot put it down! 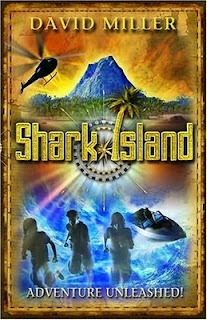 Shark Island, so called because it looks like a sharks fin rearing out of the water, is a dangerous place, as Hanna and Ned soon find out when their parents are taken by Pirates. It's up to them to save their parents. Don't be fooled by the artwork. It looks like it's for a slightly younger audience, but this book will be loved by older and younger readers alike! And the description! The location is brought to life brilliantly by Mr. Miller, who has spent many years living in Malaysia and Singapore, and this shows. This book has everything you could want from a book. Suspense. Danger. Courage. Fear. Old conflicts. Bad guys. Good guys. It's just fantastic. Fast paced too. It suits every reader. Publisheed by: Macmillan Children's Books. Format: Hardback (also available in paperback). Release date: 2007, 2008, 2009. These books are, for want of a better word, amazing. Atmospheric. Beautifully written. Fast paced. And pumped full of suspense, these books are a dream read! They follow Ping, a girl who doesn't even know how old she is, and doesn't even know her name until a little way into the first book! Sold to her Master as a slave at a young age, she has never celebrated birthdays. Set in the far western mountains of the Han Empire in Ancient China, she comes to the aid of an ageing dragon who is held captive there. The emperor is fearful of dragons after a disastrous experience earlier in life. Both slave and dragon are neglected by Master Lan, and decide to escape, to find a better life, with the mysterious dragon stone.But when the emperor finds out that one of his dragons is dead, Master Lan tells the him that it was her fault and she finds herself chased by the imperial guards, who believe she is an evil sorceress, a necromancer and a dragon hunter, who are determined to kill the dragon and take the dragon's stone, are chasing her and the dragon. Ping and the dragon, Danzi, must now trek across China in search of a safe haven, Ping discovering that she is the Dragon Keeper, and it is her destiny to protect Danzi. I think that is where I will leave it actually. The trilogy just gets better and better but if I say any more, it'll spoil the rest of the first book, Dragonkeeper, and it will definitely spoil the second and third book, Garden of the Purple Dragon and Dragon Moon respectively. What I will say is that there are more perilous journey's ahead. In my opinion, Carole Wilkinson, born in the UK before moving to Australia as a child, saved the best till last. Dragon Moon is simply brilliant. All three books are captivating, but the ending of the third book is one of the rare few occasions that I have actually cried reading a book! It's so heart-wrenching. But it works. An addictive series that I cannot recommend enough. And the cover art! Macmillan outdid themselves with these. In particular the Dragon Moon cover. It's just so beautiful! Release Date: 7th May 2009. Official synopsis: "Welcome to the Scatterhorn Museum! But don't get too excited - it's a cold and dingy place, crammed full of tatty stuffed animals and junk. Nobody much wants to visit any more, and its days are surely numbered. But when Tom is sent to live here he soon finds there is more to this museum than meets the eye. The animals may be shabby and moth-eaten - but they possess an incredible secret. And when Tom discovers he can go right back to the time of their making, a hundred years earlier, he embarks on a journey full of unimaginable terrors . . . Join Tom in his breathtaking adventure in and out of time, from an Edwardian ice fair and the wastes of Mongolia, to the jungles of India, and beyond . . ."
Wow! Wow, wow, wow, wow, wow! I don’t know where to begin! 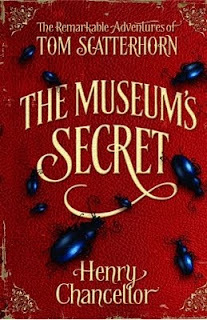 The Museum’s Secret is the first book in a trilogy. The Remarkable Adventures of Tom Scatterhorn. And boy are they remarkable! The first chapter is an explosive beginning, weaving together a beetle-hunting expedition to Mongolia, and a terrifying river of predatory beetles! We then get to meet Tom. An 11-year-old boy who’s been sent to spend the holidays with his rather eccentric Aunt and Uncle. The Scatterhorn family have owned the mysterious Scatterhorn Museum for generations. Once a grand affair, it is now in disrepair. The taxidermy animals once in real-life poses now lie shabby and moth-eaten. But there is a secret in the Scatterhorn Museum. One that for me, makes this book amazing to begin with. The animals come to life at night! Now, not many kids will tell you that they haven’t fantasised about this! The animals, the fossils, the Egyptian mummies in a museum coming to life when all of the visitors have gone home. The same principle of Toy Story. Imagining that at night, or when you aren’t around, your toys come to life. With this alone, Henry Chancellor had the child within me captured and I could not have lived with myself if I didn’t read on! But that isn’t all. There is a magical secret, even better than the animals coming to life. A secret that allows you to go back in time. 100 years. Sounds good, huh? It is. But only when there aren’t villains around to spoil the fun! And the villains in this are fantasic! Don Gervase Askary and his un-settling daughter, Lotus. They are pure evil. Their dialogue is laced with menace and every time they appear, you get a little shiver that erupts down your spine. Well I did anyway! I really don’t know what else I can say. I don’t want to spoil it for anyone. A fun, captivating read with rich characters and some beautiful descriptive writing (although this is probably also the only negative comment I have about the book, sometimes the description is a bit long, and kind of takes away from the moment, but the rest of the book more than makes up for this). It's definitely left me wanting for more! Can't wait to read the sequel! US Covers up top, UK covers on the bottom. Please click to enlarge! 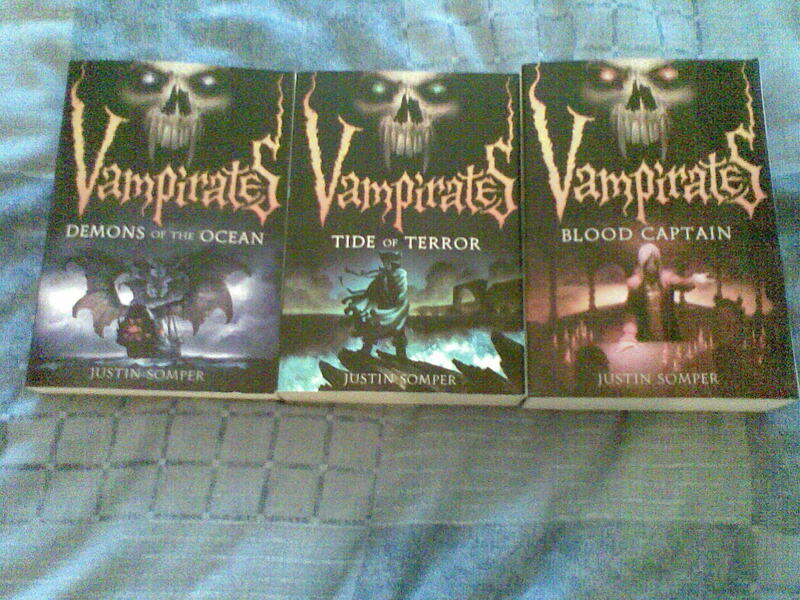 As regular readers of EoB's will know, I am a big fan of Justin and his Vampirates series. I think they are brilliant for readers of all ages and can't recommend them enough, but I don't want to talk too much about the content of the books in this post, for fear of repeating myself. This is merely a commentary on the cover art. I loved the original UK covers, and was sad when S&S made the decision to change them. But in hindsight, it's the best decision they could of made. These new covers stand out on the bookshelves. They're bright, but dark at the same time. And shiny too! I was also a big fan of the US covers, but I never felt that they had the same drawing quality that the UK covers. And then Little Brown also made the decision to re-jacket the books. And goodness what a job they have done! These new US covers which you see before you are absolutely stunning. Yes, they are kind of scary. But they are just so enticing, so intriguing. The use of the skull, the font used for the VAMPIRATES logo. The shining lights out of the eye sockets. Just simply amazing! Created by Justin Gerard, these are true works of art. One very proud Vampirate fan here! This Cover VS Cover has to go the US, I'm afraid. That's a very rare occurrence as I'm not normally a fan of US covers, but these covers are possibly my favourite so far of 2010! Well done Little Brown! Big thumbs up. Official synopsis: "Law student Lex Trent’s world is inhabited by fearsome magicians, ageing crones and a menagerie of Gods and Goddesses. And while Lex is seemingly dedicated to his legal studies he’s always enjoyed a challenge – which is why he leads a double life as the notorious cat burglar ‘The Shadowman’ who has been (luckily) evading capture for years. But Lex’s luck is about to run out because the Goddess of Fortune has selected him to be her player in the highly dangerous Games. Losing is not an option for Lex (particularly as it so often involves dying) but can he really win each of the perilous rounds? Given that the reward for doing so is money, fame and glory – all things that Lex is quite keen on – he’s going to do whatever it takes to make sure he will... and he’s certainly got good experience of cheating." I am a big fantasy fan. But I have to admit, when I saw the words Law student, I thought "Oh dear". But Alex Bell has accomplished something that I didn't think was possible. She made it fun! 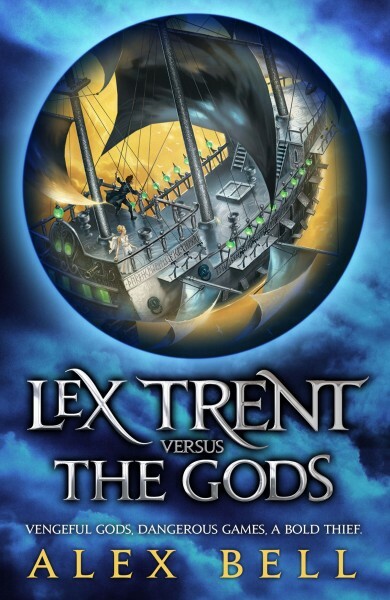 Lex Trent Versus The Gods truly is a remarkable debut YA novel. The first in a series, it's action-packed, witty, fast paced and thoroughly enjoyable. Beautifully and richly written. Lex is hand chosen by the Goddess of Fortune to play in the Games. Set up by the deities of the Lands Below for enjoyment. If he wins, he's set for money, fame and a whopping fortune. But if he loses, he can't just simply walk away. He has to die! So there is a lot at stake. But he accepts and it makes for an amazing read. Tension filled. Intriguing. And the world Bell has created is utterly fantastic. I am excited to see how Lex will explore and exploit this world further as the series progresses. The Globe has split into two perfect halfs, and is connected by an axle of ladders. How amazing does that sound? Very, is your answer! I really don't know what else to say, because I don't want to spoil this for anyone. It really is remarkable, and I cannot recommend it enough, and I cannot thank Headline enough for being kind enough to send me a copy! One very happy reader right here. In My Mailbox idea from Kristi @ The Story Siren, and all links take you to Amazon. Some would consider this a quiet week but for me, it's been pretty epic! I got these beauties! 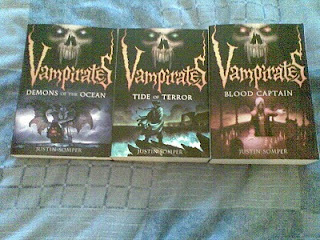 The first three books in the Vampirates series, by Justin Somper. These babies are the brand new US editions! Aren't they stunning. Definitely my favourite covers for the series, and my favourite covers for 2010 so far! Kudos to Little Brown US. These have been superbly designed. Was very excited when I opened the package. Something inside me wants to read them but they're so beautiful I don't think they should be spoiled! Don't want a crease or anything on these books. What do you guys think? Like the covers? Official synopsis: "In the bitter cold of an unrelenting winter Tomas and his son, Peter, arrive in Chust and despite the inhospitability of the villagers settle there as woodcutters. Tomas digs a channel of fast-flowing waters around their hut so they have their own little island kingdom. Peter doesn't understand why his father has done this, nor why his father carries a long battered box everywhere they go, and why he is forbidden to know its contents. But when a band of gypsies comes to the village Peter's drab existence is turned upside down. He is infatuated by the beautiful gypsy princess, Sofia, intoxicated by their love of life and drawn into their deadly quest. For these travellers are Vampire Slayers and Chust is a dying community - where the dead come back to wreak revenge on the living. Amidst the terrifying events that follow, Peter is stunned to see his father change from a disillusioned man to the warrior hero he once was. Marcus draws on his extensive research of the vampire legend and sets his story in the forbidding and remote landscapes of the 17th century. Written in his usual distinctive voice, this is also the story of a father and his son, of loss, redemption and resolution. An original interpretation of the timelessley fascinating vampire myth, and a story of father and son." First off, I can’t believe I haven’t read this, and after the epicness of it all, I feel even worse! My Swordhand Is Singing is a true vampire novel. None of your Twilight-ish vamp falls in love with a human theme here. Oh no. This is the stuff of true vampire legend! Taking you right back to 17th century Eastern Europe where the legends of the vampire were first born and bred. This is a truly good book. It’s addictive, a quality that all good books need. It’s gripping. Full of suspense. And twists and turns. It follows Peter. The son of a woodcutter who just also happens to be a drunk. They now live in a village called Chust, after living a nomadic lifestyle, never being welcome wherever they choose to stay. And then things in Chust take a dark and sinister turn. Things begin to happen that can’t be explained. Deaths. The slaughter of animals. Bodies drained of blood. But Tomas seems to know something about it, and hides a deep secret. 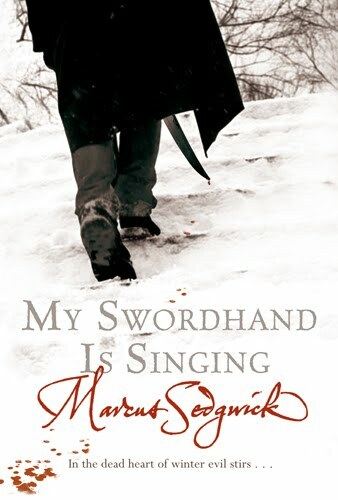 I have to say that I love the way the vampires feed in My Swordhand Is Singing. I’m not going to spell it out, as you need to read this book, and you’ll find out doing so. But it’s very different to the ways in todays literature. And they are called hostages, rather than vampires. To illiterate the idea that they really are the living dead, a hostage in their own body, rising from the grave to feed. Something I love about this book, is that it really has stayed true to these Eastern European legends. The hostages are devoid of any humanity. They are cruel and hell bent on only one thing. Blood. No love. No compassion. The true monsters they were before todays generation gave them the ability to love. These hostages are far more effective. How can you really be scared of a vampire that can love you just as much as they love drinking your blood? There is a little bit of romance in this book, but it isn’t in a Twilight way as I previously mentioned. No hostage/human loving. And it isn’t even an important theme. More of a sub-plot. Marcus Sedgwick’s writing is perfect. Fluid. Captivating. I am really glad I read this book. Really glad. I cannot recommend it enough. Bravo Mr. Sedgwick. Cannot wait to read more! Waiting on Wednesday idea from Jill atBreaking the Spine. The Cabinet of Curiosities by Paul Dowswell. When Lukas de Boodt is orphaned, his uncle summons him to Prague, a refuge for Europe's greatest alchemists and natural philosophers, offering to take him on as an apprentice. The uncle is court physician to Rudolf II, the reclusive and unstable Emperor. He is also curator of Rudolf's bizarre Cabinet of Curiosites, four halls stuffed with wonders and scientific marvels such as nails from Noah's Ark, phoenix feathers and monstrous freaks of nature, which fascinate Lukas. As Rudolf retreats further into his fantasy world, the threat of rebellion hangs in the air. Dorantes, a diplomat from Spain, comes with his daughter, Celestina, on a mission from Philip II to persuade Rudolf to give up his heretical ways. But he discovers the court is full of diplomats who have been waiting months or years for an audience with the Emperor. Dorantes notices how some had wormed their way into the Emperor's favour by presenting him with fantastic gifts for his Cabinet, and sets about creating a device that he says will stop time. But it works only in the presence of the Emperor. Lukas knows the terrible truth behind Dorantes' mission. But sinister forces have plans for Lukas too, and before he can thwart the plot against the Emperor, Lukas must gamble on Celestina's loyalty in order to save his own life." Now this sounds absolutely brilliant. An excellent premise. And the cover art is stunning. Very excited to read this when it comes out! Guest Blog at The Book Zone! A good few weeks ago, just before I moved, the excellent Darren over at The Book Zone asked me if I would like to o review Inside My Head by Jim Carrington as a guest blog. I jumped at the chance, and after finally getting settled in I had time to read it and boy what a read it is! You can check out my review here. Updated the blog with a really cool The Short Second Life Of Bree Tanner countdown! It's just made me feel pretty excited! The Museum's Secret by Henry Chancellor. 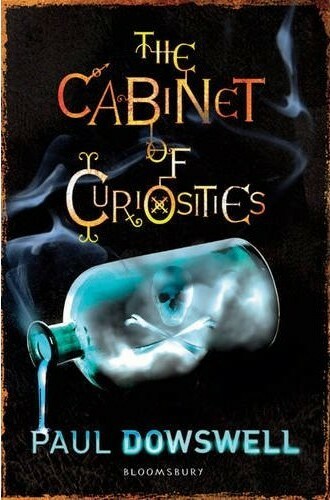 "An irresistible adventure in a world full of dust, insects, magic potions, missing jewels and stuffed animals . . . Welcome to the Scatterhorn Museum! But don't get too excited - it's a cold and dingy place, crammed full of tatty stuffed animals and junk. Nobody much wants to visit any more, and its days are surely numbered. But when Tom is sent to live here he soon finds there is more to this museum than meets the eye. The animals may be shabby and moth-eaten - but they possess an incredible secret. And when Tom discovers he can go right back to the time of their making, a hundred years earlier, he embarks on a journey full of unimaginable terrors . . . Join Tom in his breathtaking adventure in and out of time, from an Edwardian ice fair and the wastes of Mongolia, to the jungles of India, and beyond . . ."
This book sounds brilliant and I cannot wait to read it! And the cover is just stunning! Shark Island by David Miller. "Treasure Island meets The Beach in the return of the great adventure novel. Hanna, Ned and their parents are on the holiday of a lifetime on the paradise island of Kaitan. But the idyll is shattered when pirates come in the night, burning their house and kidnapping their mother and father. The children are stranded, and don't even know if their parents are alive or dead . . . In this action-packed adventure, there is no one to help. Survival and escape are up to Hanna and Ned." This sounds really really insanely good. Every boy loves a bit of a action thriller, right? And the cover in the flesh is amazing. I cannot wait to read this one! 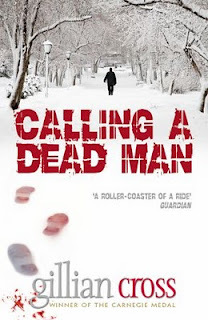 Calling A Dead Man by Gillian Cross. "John Cox is dead, killed in an explosion while at work. His younger sister Hayley can't believe he's gone. Determined to see the place of his death, she flies to Moscow with John's fiancée, Annie-but the site they're shown isn't where John died. Suddenly it seems that there's more to his death than a tragic accident. Using a tracking system to locate John's mobile phone, Hayley and Annie find the real site of the explosion . . . but they are completely at the mercy of John's former Russian boss and his English speaking son, who have taken them there. Upon recovering the phone, it's clear that John is still alive. Meanwhile, in the Siberian forest, John is being nursed back from the brink of death by a village woman. As he slowly recovers he begins to piece together the truth: he's at the heart of a dangerous power struggle between two brothers who are desperate to silence him-for good." This sounds brililliant. And the cover art is stunning. Probably one of my favourites ever. It's just so brilliant! And the picture doesn't even begin to do it justice! OUP outdid themselves this time with this cover!!! Excited to start reading now! Hope everyone has a great week!